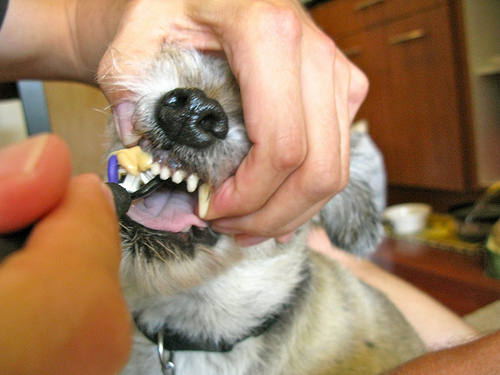 Yes you can brush your dog’s teeth. At my wife’s insistence, we took our 8-year-old dog in for a professional cleaning, without anesthesia. Had they tried this with our previous dog, who unfortunately succumbed to old age several years ago, the staff would have needed a first aid kit handy to patch up all the wounds on their fingers and hands. But our present dog, who has a very laid back, smoke-em-if-you-got-em attitude, endured the process without so much as a whiff of nitrous oxide, I was told. Although this was a shelter dog who apparently spent some time roaming the mean streets of South Florida solo, his dental health was absolutely impeccable. Well, maybe not impeccable. He had some enamel stains which is not surprising considering the unknown material he likes to dig up in our backyard and and chew on. He also had a lot of plaque and mild case of gingivitis, but overall he had no missing or loose teeth so I was quite impressed. They recommended that we have our dog brush regularly and use an oral rinse. So I’ve been trying to teach him how to rinse and spit just with plain water as practice, but he can’t seem to get the hang of it. The other danger is that it can turn your pet into a communist. Just kidding on that one. One advantage to having your dog’s teeth cleaned is that when he arrives home, his breath is minty-fresh. But I noticed that only lasted for a few hours. His teeth are now pearly white though, the color of porcelain on a freshly cleaned sink at the Holiday Inn. So I’m off to buy my dog his first toothbrush and then it’s on to the pet store to purchase some special dog toothpaste, with extra-low flouride levels. Yes, I know he should be flossing as well but really, how much can you expect? Perhaps if we got him his own WaterPik ….